Just when Tab is afraid she’ll burst from keeping the secret of Joe inside, she finds Life by Committee. The rules of LBC are simple: tell a secret, receive an assignment. Complete the assignment to keep your secret safe. Tab likes it that the assignments push her to her limits, empowering her to live boldly and go further than she’d ever go on her own. But in the name of truth and bravery, how far is too far to go? Life can get hard sometimes, especially when you’re faced with decisions that feel impossible. It would be a whole lot easier if someone with some authority and life experience chose for you and just told you what to do, wouldn’t it? Well, that’s precisely what Tabitha experiences in Life by Committee, Corey Ann Haydu’s sophomore novel. Among the things I liked best about Life by Committee, the concept is easily number one. The committee is a fascinating concept – a place where secrets are shared, where empathy, commentary and encouragement flow freely. It is also where a stranger will give you a task related to your secret to complete, no ifs, ands or buts. At first glance, it’s all very positive; members are encouraged to exit their comfort zones, wrangling life until it’s under their control. But upon further contemplation, it’s actually very scary. These people wind up controlling your life and actions, thus effectively taking you out of the equation. I’m not discrediting the fact that advice and encouragement are necessary. But I do think that it’s important to learn how to decide things for yourself, based on what you feel is right and true to who you are. Otherwise, you’re forever going to be under other people’s thumbs – and I don’t think any of us would want that. Tabitha – Let’s set the record straight: I didn’t like Tabitha initially. She felt selfish and silly, a girl who rushed into things impulsively. But the more I read about her, the more I found myself understanding her. In the end, she strikes me as a real character, flaws and all, and I really liked that. Tabitha’s (secret) relationship with Joe – Oh honey. It’s all too easy to fall for the boy who shows his vulnerable side around you. It’s all too easy to believe, to hope that he is going to leave his girlfriend. While I understand the temptation, here are two things I’d say to you: (1) Joe is bad news and (2) cheating is never justifiable. Tabitha’s parents – Her parents are young, but they make a decent living running a well-known local café. (I wish my family owned a café like theirs!). It makes me glad that they do their best to be involved in Tabitha’s life, offering support and advice when needed. Tabitha’s “friends” – I’m still kind of pissed off at her former best friends. Just because someone is changing, you don’t ditch them. People change as their situations in life change; that’s perfectly normal. Tabitha’s friend – I’m all for friends who are supportive and non-judgmental. What Tabitha did to her wasn’t cool (at all. I’m still kind of angry), but the best kind of friend is the kind that can forgive you. 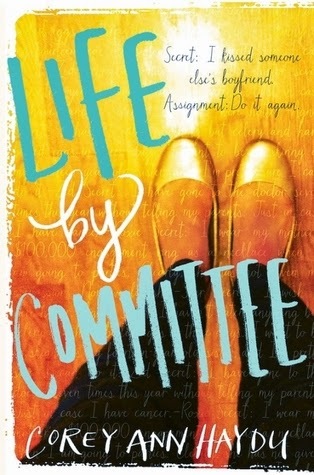 Life by Committee is a contemporary novel that inspires reflection. I easily identified with Tabitha on many levels, and I’m sure others will too. Though there are a few Mean Girls elements in there (particularly towards the end), Life by Committee is a story that stands strong on its own. This was my first experience with Corey Ann Haydu, and it certainly won’t be my last! Apart from book blogging, have you been part of any online communities? I've been heavily involved in the internet since 2002! I started out reading a lot of fan fiction - NSYNC and Blue (a British boyband) especially, followed shortly by Westlife. I was a member of many fan fiction forums for those three artists, and eventually joined fanfiction.net (where I'm still a member, though I only have one story up, and it's Glee fan fiction!). I'd say that, apart from my social media sites and book blogging, I'm still quite involved in the online fan fiction community for Harry Potter these days (since all three of these boy bands have since disbanded, boo). I loved this book! Like you, I found Tabitha really relatable even though she was pretty flawed. And I absolutely loved her parents. They were far from perfect, but they were present in her life and you could tell they really cared about her. Tabitha was a very real character for me, too. I agree that it makes her harder to like/connect to at first, but in the end that's the kind of character I really like. You should definitely read OCD Love Story. I think I liked Life By Committee a little bit better, but OCD Love Story is another unique, really well done story.